Three-piece bands are just right. Don’t ask us why, they just are so well-balanced. ZZ Top, Motorhead, Rush? End of chat. Anyway Brummie trio, Crimson Star sound like none of these, but they are proof positive that there is nothing that your humble triumvirate can’t achieve. Forming back in 2012, the band have been at it for a while, releasing some good stuff (MV’s Damian was particularly taken with their EP a couple of years back) and playing some fine live shows, but it rather seems that everything they have done up to now has been leading to “Bay View” as the five tracker is really very, very good indeed. The band spent last Summer crafting the thing with esteemed producer, Romesh Dodangoda (Lower Than Atlantis, Bring Me The Horizon, Funeral For A Friend) and the results are spectacular. As if eager to get cracking, “The Pragmatist” kicks off with the bare minimum of intro. It’s tale of obsession (“I’d give everything I own just to have you”) is reminiscent of the widescreen efforts of The Zico Chain a few years back, pummeling and with an electricity coursing through its veins, it is a stellar opener. That’s not to say that the rest don’t back it up superbly. “La Prom” arguably boasts a bigger hook, and there is a touch of Nirvana here. 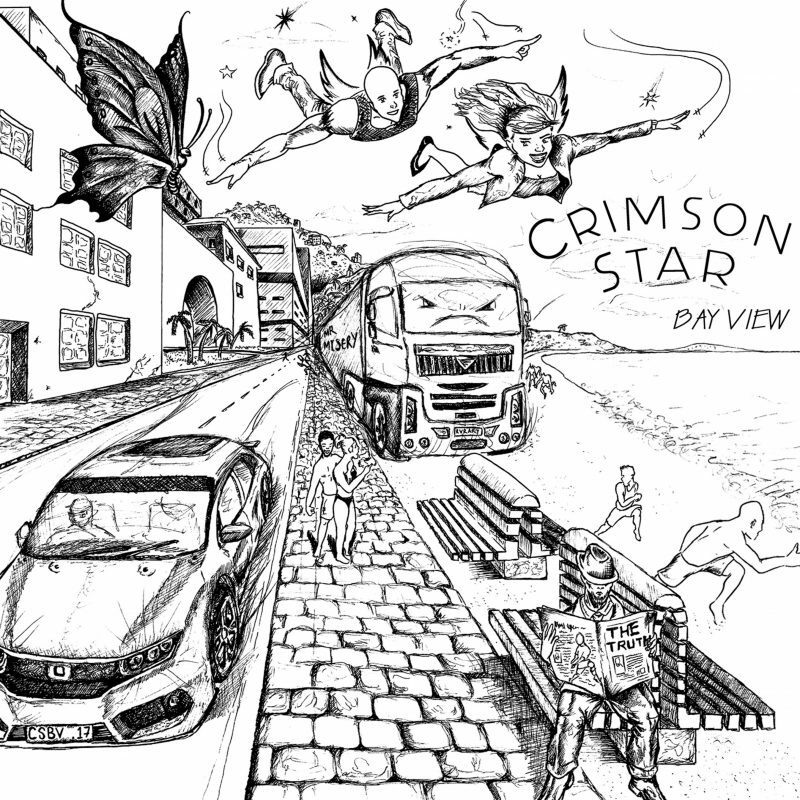 Crimson Star might not be quite there yet, but they do merrily manage riffs that would shake the walls of arenas given half a chance, James Shaw provides both those and the soaring vocals. Never better do these combine than on “Once” which rumbles a little like Royal Blood, while nowhere else do the band show their diversity more skilfully than on “Euthanise Me”. If this was a band from Southern California they’d probably be proclaimed as the heirs to Kyuss’ crown as purveyors of dry as dust desert rock. There is something malevolent in these grooves too. Equally, there is something primal in the sonics of “Gimme Some”. Hair is let down at the start, while it broods carefully before getting down in a very pleasing Seether type way in its chorus. It also concludes a confident, classy five tracks that show a band that is coming of age. The Crimson Star is shining, and it illuminates a band that is very much on the up.